Home/Additives/See the Natural Colors Petition Video Contest Winners! Add Your Name to the Petition Today! 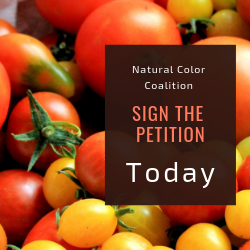 I’ve written to you before about the Natural Colors Coalition Petition to get food makers to use natural colors instead of artificial ones. We’re racking up signers and your efforts have helped. But we need more people to sign if we’re going to succeed. One thing that is helping us is the video contest sponsored by the Natural Color Coalition. The winners are in and I think you’ll get a smile when you see what the young contestants created. You’ll recall that I wrote last time that a lot of top managers in the food business WANT to switch to natural colors in their food products. They’ve made some progress. But because they have to answer to boards and stockholders who have other priorities, making the switch frequently falls to the bottom of their action list. BUT, if consumers like you – including some who own stock in these companies – make it clear that you want natural coloring in foods sooner rather than later, those managers will be able to push this issue up higher on their action list. This is where we are breaking the paradigm of public pressure on corporate America. Instead of threatening companies, we are looking for ways to help allies INSIDE companies who want to move forward with positive change. We aim to provide some gentle pressure in the form of encouragement. In short, we want to tell the companies whose products we like that we would like them even more if those products were made with natural colors. So, Citizens for Health is working with the Natural Color Coalition to ask food companies to move to natural colors in all of their products. We’re also asking makers of drugs, textiles, cosmetics, and personal care products (such as hair dyes, shampoos, and deodorants) to do the same. Perhaps most important, these products are ingested, worn or applied on the skin disproportionately by young people – sweets, soft drinks, macaroni and cheese, popcorn, juice drinks, cough medicine, hair dye and deodorants are just some examples. Studies show that young people are the most susceptible to the ill effects of artificial colors. Those effects include irritability, aggression, speech difficulties, seizures, and the many symptoms associated with Attention Deficit/Hyperactivity Disorder or ADHD. We can no longer hope that the FDA will act. I worked on this issue back in the late 1960s when I wrote The Chemical Feast: Ralph Nader’s Study Group Report on the Food and Drug Administration. But here we are – some 50 years later – and very little has been done by the agency. The public, however, has moved on. It no longer wants to eat, apply or wear any more coal tars, petroleum derivatives, synthetic indigo dyes (used to dye blue jeans) or other chemical colors. So, if the industries that produce our food, drugs, cosmetics, personal care products, and textiles understand that their customers want natural colors without further delay, we believe it can happen without any action by the FDA. Corporate managers are ready to hear from engaged consumers. One way to do that is to sign our petition. It’s easy to sign and put yourself on record as supporting the switch to natural colors. The greater the number of people signing, the more quickly we will get the natural colors we prefer. Just click below to start the process. Let’s be part of the solution for ourselves, our children and our grandchildren. Putting your name on this petition is a simple, but important step toward making healthier natural colors available in products for everyone, but especially for our young people. P.S. We plan to use this approach on other projects. Corporate planners say they are ready. Let’s help them.